After getting into hot water for opening new PC copies of Square Enix's Deus Ex: Human Revolution and removing codes for a free OnLive version of the game prior to sale, video game retailer GameStop has pulled the games from its shelves pending recall. 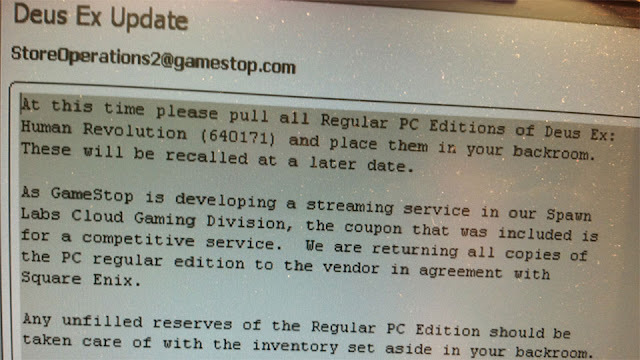 According to an email pictured below from an anonymous source and confirmed via GameStop retail employees, the company instructs employees to remove any retail copies of the PC version of the game to the back room of the store pending recall at a later date. Note that the recall is being performed in agreement with Square Enix, indicating the two companies have been in communication regarding the situation. If I were the distributor, I would make Gamestop eat any opened copies. How sleazy of them!